CCM Gateway is a next-generation solution to the challenges of archiving and managing transactional customer communications. It supports market leading enterprise content management systems as well as document and archiving platforms from Alfresco, Microsoft and IBM. 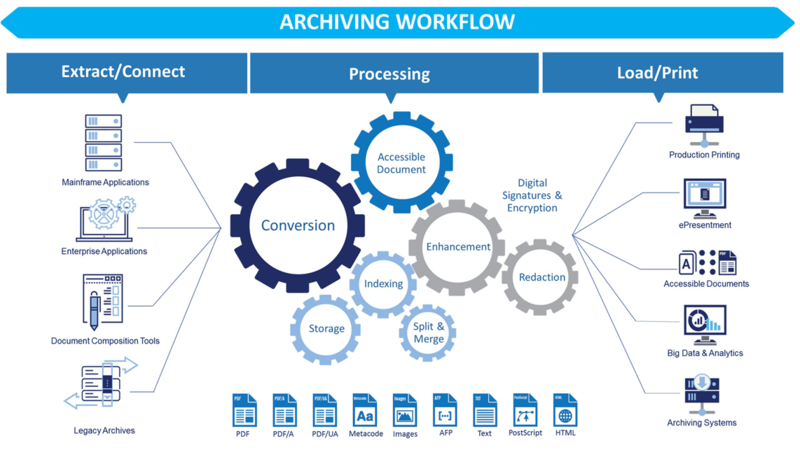 This tool offers universal print-stream archiving and print stream conversion across industries and business applications. It classifies, transforms, indexes, and efficiently stores high-volume documents of almost any kind. The solution supports a wide range of source document formats including AFP, Xerox Metacode, PCL, PostScript and images. CCM Gateway provides the flexibility to archive in native formats or in industry standard formats like PDF/A, and can automatically convert archived content to the format needed for print output, to HTML5 or PDF for ePresentment, or to Accessible PDF or Accessible HTML to meet the needs of blind and partially sighted individuals. With Crawford Technologies’ CCM Gateway you can consolidate disparate archiving systems, including legacy archives, migrate to platforms that are more cost-effective, and make print and digital streams available to customer service and consumer portals. Store customer communications in Alfresco using advanced ECM features. A next generation solution to the problems of archiving customer communications.